Waste not, want not. This crafty guide perfect for anyone looking to enjoy the simple pleasures of life. Nowadays, many of us “outsource” basic tasks. Food is instant, ready-made, and processed with unhealthy additives. Dry cleaners press shirts, delivery guys bring pizza, gardeners tend flowers, and, yes, tailors sew on those pesky buttons. But life can be much simpler, sweeter, and richer–and a lot more fun, too! As your grandmother might say, now is not the time to be careless with your money, and it actually pays to learn how to do things yourself! 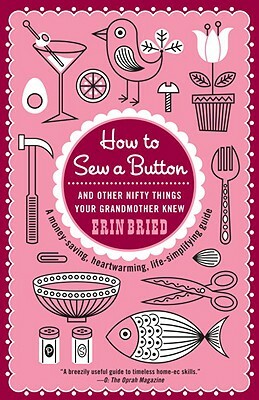 Complete with helpful illustrations and brimming with nostalgic charm, How to Sew a Button provides calm and comfort in uncertain times. By doing things yourself, with care and attention, you and your loved ones will feel the pleasing rewards of a job well done. Erin Bried is a Senior Staff Writer at SELF magazine, where she’s penned nearly 200 stories, including 60 cover stories, in the past nine years. In addition to interviewing and profiling celebrities such as Angelina Jolie, Cameron Diaz, Jennifer Aniston and Sheryl Crow, she covers health, fitness, nutrition and psychology. Formerly, Bried was a Senior Editor at Glamour, a contributor at Golf For Women magazine and a Senior Editor/Writer at Condé Nast’s Women’s Sports & Fitness. She lives in Brooklyn, New York.